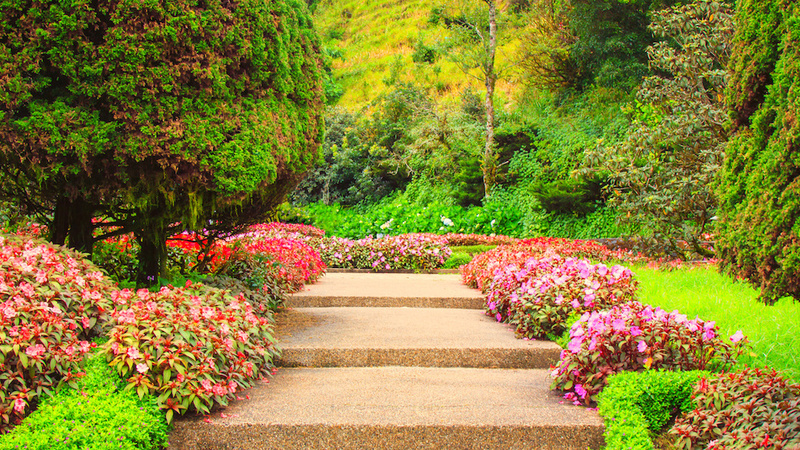 A home's landscaping can have a big impact on its curb appeal, which in the long run can improve the overall value of a home and help sell the home faster. The best way to improve landscaping and curb appeal is to promote healthy growth on the lawn and in the garden beds. These tips can help homeowners make their landscaping and their home look more attractive. Bushes have a way of growing lanky and spindly over time. When this happens, the best way to make the shrub look healthy and strong is through pruning. Pruning causes a spurt of healthy, lush green growth. For most shrubs, the best time to prune is in early spring. Pruning in early spring gives the shrub all growing season to produce leafy green growth. This ensures the plant will be strong enough to handle cold weather when the winter comes around again. Homeowners who aren't sure how to prune their shrubs can find out more about pruning at a local nursery. Grass needs regular attention in order to look its best. This attention usually includes trimming, regular watering and fertilizing. Grass needs special fertilizer with a lot of nitrogen to develop green, healthy growth. For many homeowners, the first fertilization of the year occurs in early to mid spring. Fertilizer is applied again one month later, and then every 6 weeks following. Most grass needs to be watered one to two times per week to a depth of six inches in the soil. Grass should never have more than 1/3 of its length cut at any time, as this can cause the grass to become unhealthy and diseased. Flowers make lawns look much more attractive, especially flowers with an abundance of colorful blossoms. Homeowners who want to improve the appearance of their Tierra Verde home quickly can generally do so by planting flowers that grow fast. Common examples include annuals like petunias and impatiens. Grass may not grow very well under trees with deep shade, but bare patches can mar a lawn, leaving it looking unhealthy. Even shade-tolerant grass has a problem growing under shade trees. When this is a problem, some homeowners turn to ground cover instead of grass. Some types of ground cover, like hostas, grow very well in shady conditions. These beautiful plants with long, heart-shaped leaves are attractive and non-invasive, so they're easy to control or remove when the time comes. Homeowners hoping to make their landscaping more attractive can talk to a professional landscape artist. Working with a good landscape artist, a homeowner can improve their property's value and turn their home into a masterpiece.